Addison Wesley, 2004-10-25. Hardcover. Good. 2008-04-03. New. Ships with Tracking Number! INTERNATIONAL WORLDWIDE Shipping available. Buy with confidence, excellent customer service! 2009-02-02. New. Ships with Tracking Number! INTERNATIONAL WORLDWIDE Shipping available. Buy with confidence, excellent customer service! 2010-01-09. New. Ships with Tracking Number! INTERNATIONAL WORLDWIDE Shipping available. Buy with confidence, excellent customer service! Addison-Wesley, 2008-07-16. 6. Hardcover. Used:Good. 2013-03-08. New. Ships with Tracking Number! INTERNATIONAL WORLDWIDE Shipping available. Buy with confidence, excellent customer service! 2013-05-05. New. Ships with Tracking Number! INTERNATIONAL WORLDWIDE Shipping available. Buy with confidence, excellent customer service! 2013-02-03. New. Ships with Tracking Number! INTERNATIONAL WORLDWIDE Shipping available. Buy with confidence, excellent customer service! 2013-08-04. New. Ships with Tracking Number! INTERNATIONAL WORLDWIDE Shipping available. Buy with confidence, excellent customer service! Pearson. Hardcover. 0321625919 . New. 2013. 2013-06-29. New. Ships with Tracking Number! INTERNATIONAL WORLDWIDE Shipping available. Buy with confidence, excellent customer service! 2014-02-08. New. Ships with Tracking Number! INTERNATIONAL WORLDWIDE Shipping available. Buy with confidence, excellent customer service! 2013-06-07. New. Ships with Tracking Number! INTERNATIONAL WORLDWIDE Shipping available. Buy with confidence, excellent customer service! Addison-Wesley, 2009-12-31. 6. Loose Leaf. Used:Good. Addison-Wesley, 2009-12-27. 6. Loose Leaf. Used:Good. Addison-Wesley, 2004-01-17. 6th. Paperback. Used:Good. 2004-04-04. New. Ships with Tracking Number! INTERNATIONAL WORLDWIDE Shipping available. Buy with confidence, excellent customer service! 2013-06-08. New. Ships with Tracking Number! INTERNATIONAL WORLDWIDE Shipping available. Buy with confidence, excellent customer service! Pearson. PAPERBACK. 0321733622 New Textbook, Ships with Emailed Tracking from USA . New. 2013-06-05. New. Ships with Tracking Number! INTERNATIONAL WORLDWIDE Shipping available. Buy with confidence, excellent customer service! 2015-02-08. New. Ships with Tracking Number! INTERNATIONAL WORLDWIDE Shipping available. Buy with confidence, excellent customer service! Pearson. Hardcover. 0321625927 New US Edition Textbook, Ships with Emailed Tracking from USA . New. Prentice Hall. PAPERBACK. 013035256X New Textbook, Ships with Emailed Tracking from USA . New. 2004-08-19. New. Ships with Tracking Number! INTERNATIONAL WORLDWIDE Shipping available. Buy with confidence, excellent customer service! 2004-05-01. New. Ships with Tracking Number! INTERNATIONAL WORLDWIDE Shipping available. Buy with confidence, excellent customer service! Pearson. Hardcover. 0321625919 New Textbook, Ships with Emailed Tracking from USA . New. Pearson. Hardcover. 0321625927 Special order direct from the distributor . New. Prentice Hall, 2004-09-01. 6. Hardcover. Used:Good. Pearson/Prentice Hall. Hardcover. 0130606200 New Textbook, Ships with Emailed Tracking from USA . New. 20040208. Good. Ships with Tracking Number! INTERNATIONAL WORLDWIDE Shipping available. May not contain Access Codes or Supplements. May be ex-library. Shipping & Handling by region. Buy with confidence, excellent customer service! 2013-08-04. Good. Ships with Tracking Number! INTERNATIONAL WORLDWIDE Shipping available. May not contain Access Codes or Supplements. May be ex-library. Shipping & Handling by region. Buy with confidence, excellent customer service! 2008-02-02. New. Ships with Tracking Number! INTERNATIONAL WORLDWIDE Shipping available. Buy with confidence, excellent customer service! 2009-02-06. New. Ships with Tracking Number! INTERNATIONAL WORLDWIDE Shipping available. Buy with confidence, excellent customer service! 2013-06-07. Good. Ships with Tracking Number! INTERNATIONAL WORLDWIDE Shipping available. May not contain Access Codes or Supplements. May be ex-library. Shipping & Handling by region. Buy with confidence, excellent customer service! Pearson. Hardcover. 0321985281 BRAND NEW W/FAST SHIPPING! This item is: Physics: Principles and Applications and Modified Mastering Physics with eText and Access Card, 7th Ed., 2014, by Giancoli, Douglas C.; FORMAT: Kit/Package/ShrinkWrap; ISBN: 9780321985286. Choose Expedited for fastest shipping! Our 98%+ rating proves our commitment! We cannot ship to PO Boxes/APO address. To avoid ordering the wrong item, please check your item's ISBN number! . New. Pearson. Hardcover. 0321625919 BRAND NEW W/FAST SHIPPING! 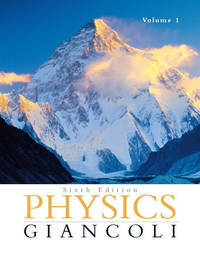 This item is: Physics: Principles With Applications Plus Mastering Physics with eText -- Access Card Package, 7th Ed., 2014, by Giancoli, Douglas C.; FORMAT: Hardcover Bound w/ Access Card; ISBN: 9780321625915. Choose Expedited for fastest shipping! Our 98%+ rating proves our commitment! We cannot ship to PO Boxes/APO address. To avoid ordering the wrong item, please check your item's ISBN number! . New. 2013-06-05. Good. Ships with Tracking Number! INTERNATIONAL WORLDWIDE Shipping available. May not contain Access Codes or Supplements. May be ex-library. Shipping & Handling by region. Buy with confidence, excellent customer service! Pearson. PAPERBACK. 0321762428 New Textbook, Ships with Emailed Tracking from USA . New. Addison-Wesley, 2008-07-18. 6. Paperback. Used:Good. 1991-09-09. New. Ships with Tracking Number! INTERNATIONAL WORLDWIDE Shipping available. Buy with confidence, excellent customer service! Pearson. PAPERBACK. 032192889X Special order direct from the distributor . New. This book is the 7th edition, published in 2014. ISBN: 0321767918. Instructor's Review Copy. Hardcover.